In response to growing opportunities for water resources and environmental projects in the Phoenix area, Montgomery & Associates (M&A) is pleased to announce that Lauren Candreva, P.G., joined its Phoenix office as a senior hydrogeologist effective March 19, 2019. Well-known in the water resources and mining industries in the Southwest, Lauren brings to M&A 15 years of diverse experience in the areas of water supply well design, environmental site characterization, and groundwater permitting. 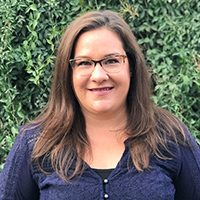 She has extensive field experience in Arizona and California and has managed a variety of projects related to water supply and recharge, mining hydrogeology, and environmental hydrogeology. We look forward to working with Lauren as she helps us expand our services in Phoenix and partner with industrial clients, engineering firms, municipalities, and agricultural agencies. For more information about M&A and its operations in Phoenix, contact Lauren or Dennis Hall.